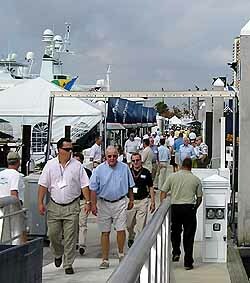 The 47th annual Fort Lauderdale Boat Show opened Thursday, November 5 with Special Preview Day. Attendance was at lower levels than previous years due to Hurricane Wilma forcing rescheduling of the show one week late and a day short. However, enough serious buyers were around to stimulate activity on the boats presented. Prime Time Preview: Thursday, November 3: 10:00 a.m. - 7:00 p.m.
Friday, November 4, 2004: 10:00 a.m. - 7:00 p.m.
Saturday, November 5, 2004: 10:00 a.m. - 7:00 p.m.
Sunday, November 6, 2004: 10:00 a.m. - 7:00 p.m.
Quantum Marine Engineering has been enjoying huge succes with both Zero Speed stabilization and large numbers of stabilizer control conversions. 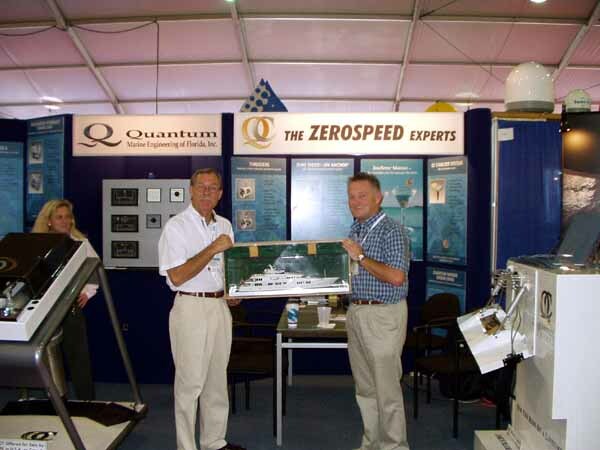 Mike Perkins is shown here with the happy captain and his new construction Feadship featuring a Zero Speed installation. 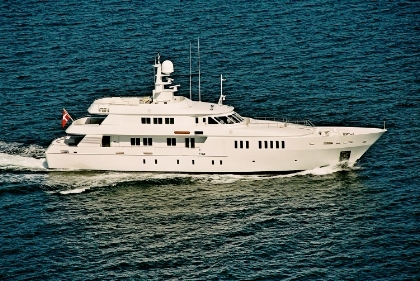 John Decaro of Fraser Yachts Worldwide has a web site dedicated to the design and construction of semi custom and custom, full displacement trawlers, explorer yachts and expedition type vessels and the sale of existing boats. 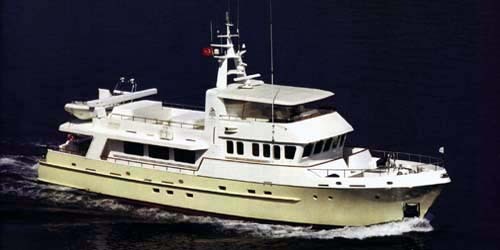 John showed explorer vessels as well as new designs at the Show. 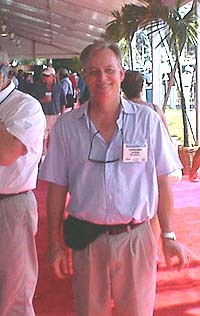 Richard George, owner of Captain-Net, was at the Show again this year seeing his clients. Captain-Net made sue to get pictures and tidbits of information for site owner client use and product info. Rich doesn't mind answering web site inquiries either! Michael Robilio and company enjoyed an excellent turnout for the Boat Show booth this year. 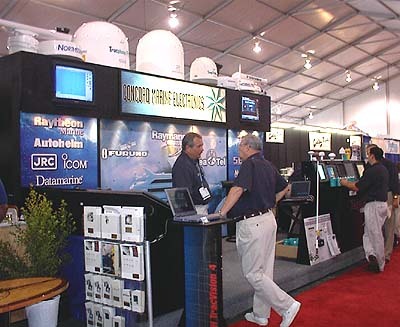 Marine electronics manufacturers offer special Boat Show discounts to compete for the heavy traffic opportunities. Concord posts Boat Show discounts on their web site. 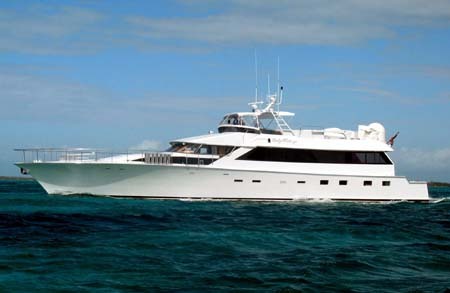 Mike Sharpe of Ardell's Yacht and Ship has debuted his new web site LargeYachtForSale.com this year and is looking forward to seeing old clients and friends as well as meeting new ones.